1991 Seattle. After being stuck up for money by a panhandler mob at an out of the way car park, I didn’t think anything else was going to register about that trip. But looking back, there were two standout activities. Taking the trail at the Olympic National Park Visitor Center to the summit was amazing. I started out in the fog. As I rested on a rock a ways up the trail, the fog cleared enough to see a nearby wolverine! I was hooked; I had to keep going. Much further on, the ground had about six inches of snow and a boy, coming down the trail and wearing sandals, encouraged me to soldier on. When I reached the summit, the sun glowed on alpine meadows covered with colorful, delicate flowers. After about 15 minutes, the fog fell over all and I began my descent as I had started, in the fog. I confess on that descent, I stepped off the path and clung to the embankment along a sharp drop. That was despite the Visitor Center’s admonishment to stay on the trail. I felt guilty. But I felt better when I realized the shouts of encouragement from a group further down the trail were directed at me. 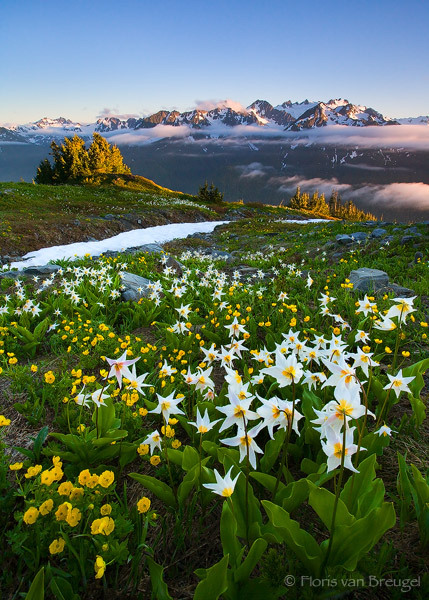 See the alpine flowers of Olympic National Park. The other highlight of the Seattle area was a boat ride to Blake Island for a Native American luau of sorts. (And that seemed fitting as Seattle was the name of a tribal chief in the 1800s.) At Blake Island, we waited for lunch while salmon, strapped to sticks, roasted around an open fire. Once the meal was ready, we tourists filled our plates and sat at long tables. While we feasted, masked dancers re-enacted local Native American stories on a stage. Some of the dancers actually wore those fantastic Pacific Northwest masks that look like huge bird heads. A long admirer of those masks hanging in cases at museums, I was entranced to see someone wearing such a mask while dancing. It was at Blake Island I learned that you put your arms in the upper and lower beak to open and close the beak, making the bird creature much more imposing than the static mask displays had ever let on. See a bird mask of the Pacific Northwest.